On July 30 approximately 25 children from Bronson, Chiefland, and Williston gathered at the Bronson Youth League Park for a safety program. 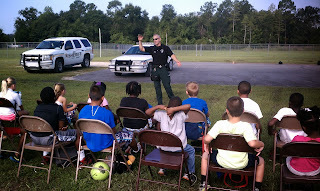 This program is designed to educate our local children on various safety topics. The Town of Bronson Parks and Recreation Department sponsors and hosts this summer children's program and it is under the direction of Bronson Council Member Beatrice Roberts and Director Curtis Stacy. Sgt. Max Long spoke to the children about personal safety at school and home. Topics included drug abuse, alcohol abuse, firearm safety and bullying. Deputy Kevin Kinik spoke to the children about his K-9 partner "Rossi" and provided demonstrations of his training and discipline. Rossi showcased his talents and ability to detect different odors and how he can take down a dangerous suspect. 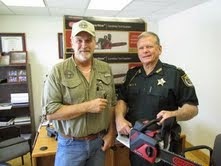 Levy County Emergency Management Director Mark Johnson presents Levy County Sheriff McCallum with 4 battery operated chain saws to outfit LCSO Deputies for storm situations. This new purchase resulted from a suggestion from Deputy Jeremy Dean. Concerned with maintaining gas operated saws and the fumes associated with transporting mixed gasoline, Deputy Dean researched and located this alternative. The Tax Payers along with LCSO, the Emergency Operations Center and the Levy County Road Department will reap the benefits of these new tools. As we move forward into the hurricane season, these new saws can be more safely transported and stored in LCSO vehicles. This allows faster utilization to assist the Road Department in rapidly clearing blocked roads during storm events. 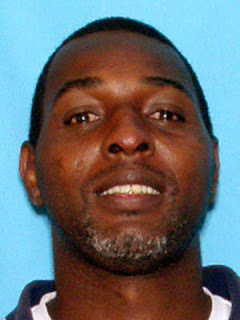 On July 18, 2013 Robert Lewis Jr registered as a Sexual Predator with the Levy County Sheriff's Office. By Florida law Lewis is required to notify law enforcement whenever he changes addresses. Robert Lewis Jr was convicted in 2005 in Alachua County, Fl for Sexual Battery; F.S. 794.011 (5) (PRINCIPAL). Lewis established his address as: 21161 NE 35 Street Williston, Fl. For a complete listing of all registered sexual predators and offenders residing in Levy County, or to search by zip code, please visit www.fdle.state.fl.us and go to the sexual data base.